Yep, we were there.As usual Wayne did an excellent job with the club stand. 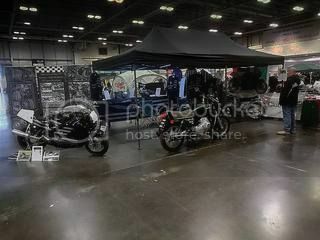 Two race bikes, plenty of paraphernalia, a Van Veen OCR 1000 and an DKW W2000 were exhibited. One club meber "Nick" I think, came and introduced himself. It was very nice to meet you, sorry if I've got your name wrong.The club stand was very successful and busy on both days even though I was only there on Sunday Wayne tells me Saturday was also busy. Because this was the first time for this show we didn't bother to recruit members bikes or volunteers, things will be different next year though.The venue is really good, loads of room, plenty of parking, excellent food and drink facilities and spotlessly clean bogs too. Also, a bit of a bonus there was a lot of women present and good looking ones too.I think we should do it again.Joe. Jo Missed you last commentYes there was some very good-looking women interested in the memorabilia and joes vanveen (I recon due to the paint scheme).Also can someone sell me a knackered left hand endplate so I can display my knackered moiled one its on the demo air coolled engine, I was reedy for loosing it with the "rotor seals don't last comment" Regards Joe. After Richard has checked out my left hand End Plate(hopefully it will be ok ) if not I can let you have it to use as a"before and after" example,J.B. Thanks for taking a look and my late reply, I had a bit of a accident at work just before Christmas and was not up to posting on forums. Hi Wayne,sorry to hear about your little mishap,hope you are fully recovered and are fighting fit once more ,rgds,J.B.